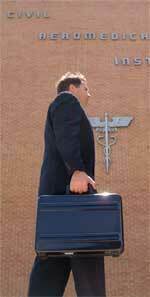 Pilot Medical Solutions retrieves, organizes and pre-qualifies documentation required for time-consuming cases. Select AME’s receive patient referrals and extensive case management support. Our partnerships with AME’s streamlines complex medical certification. Practicing medicine leaves precious little time to compile the documentation required by the FAA when abnormal findings are present. With Pilot Medical Solution’s Pre-Certification Case Management, treating physicians receive unlimited clear communication regarding the FAA’s requirements. Our office collaborates personally with each medical facility to obtain the necessary records in the least amount of time. Our relationship and close proximity to the FAA’s Aeromedical Certification Division facilitates expeditious processing for complex cases. Since all essential documentation is available at the time of the FAA examination, AME’s save valuable time once lost to tracking down records or waiting for special authorization. AME’s may issue a medical certificate rather than defer a pilot’s application. In an average year, Dr. Guy Baldwin performed over 2,000 FAA exams. Pilot Medical Solutions directed by David Hale provides a service that is valuable to AME’s and critical to airman with special needs. A good example of this is the recent 47-year-old Class II applicant with a history of hypertension, ulcerative colitis, and cholelithiasis. Prior to his appointment with me, Pilot Medical Solutions retrieved records from CAMI in Oklahoma City, his practitioners, medical facilities, and obtained a narrative for his conditions. Needless to say, his airman medical exam required no additional time than one with no medical problems. Pilots who may benefit from weight loss or lifestyle modification are given specific instructions, and or exercise prescriptions. In summary, Pilot Medical Solutions provides professional support for AME’s that I believe is crucial to streamlining aeromedical care. I would be happy to provide expanded recommendations for anyone considering their services.